Blaeu, W. - Das Wiflispurgergow. Das Wiflispurgergow. - Blaeu, W.
Description :Willem Blaeu, founder of the famous publishing firm. 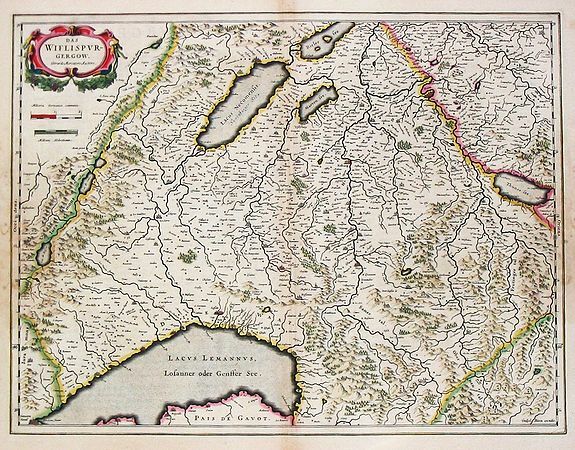 Originally publishing pilot-guides, he issued his first atlas, 'Atlantis Appendix', in 1630, followed by his "Theatrum Orbis Terrarum" or "Novus Atlas" in 1635.Willem Blaeu's map of the southwestern part of Switzerland, based on the map by Gerard Mercator. From the French edition of Willem Blaeu's atlas "Theatrum".